Endocarditis is inflammation of the endocardium, usually involving the heart valves. Although there are noninfectious causes of endocarditis such as Libman-Sacks endocarditis (LSE) from immune complex deposition in autoimmune diseases such as systemic lupus erythematosus (SLE—remember SLE causes LSE! ), infectious endocarditis is the most common endocarditis and the most highly tested on the USMLE Step 1. Bacteria are a very common cause of infective endocarditis where the valves themselves will become infected. The gross pathological image below demonstrates such a colonization. Infection of the valve will disrupt is function, leading to regurgitation/murmurs. Fever: most common symptom due to literal infection of the AV nodes. 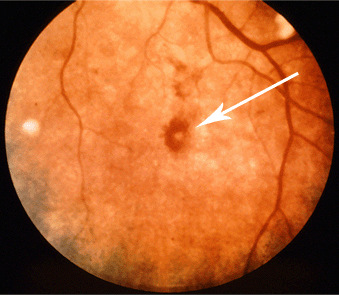 Roth spots:retinal hemorrhages that have white/pale centers. White exudate can also be present. This is caused by immune complex deposition in this condition. See image below. 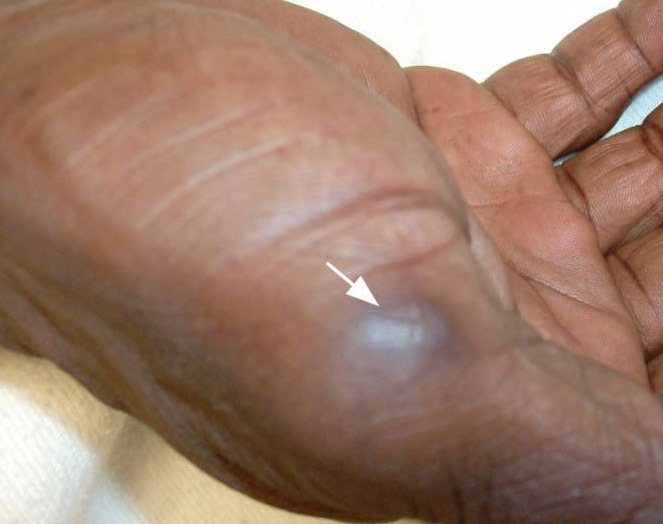 Osler nodes: painful, raised, red lesions commonly found on the hands and feet. Caused by deposition of immune complexes. Murmur: heart murmurs (most commonly a mitral regurgitation murmur because this valve is often infected) can be heard on the physical exam. Janeway lesion: non-tender hemorrhagic lesion often found on extremities. These can be confused with Osler nodes however remember that Janeway lesions are non-tender! Anemia: patients will often have anemia of chronic disease (due to a persistent state of inflammation). Decreased hemoglobin, and mean corpuscular volume (MCV). Nail bed splinter hemorrhage: these look like splinters found under the nail bed, and are linear reddish brown lesions. Emboli: small pieces of the vegetation can dislocated leading to pulmonary emboli (if colonization of right heart) or strokes/peripheral organ infarcts (if the left heart was the site of colonization). Diagnosis is by history and physical exam, echocardiography to visualize the vegetation or valvular abnormality, and blood cultures to isolate the organism. Echocardiography: visualization of growth/vegetation on the valve surface. Treatment is antibiotics, usually for at least a month (if bacterial cause)! Specific treatment depends on strain of bacteria that has infected the valve (see specific pathogens listed below). In-hospital mortality 17.7% worldwide in patients with infective endocarditis (IE) from 2000 to 2005 (ref). Preventing infections if that was the casual agent. Cardioembolic stroke: portions of the valve vegetation can travel to the circulation into the brain and cause a stroke (due to septic embolism). 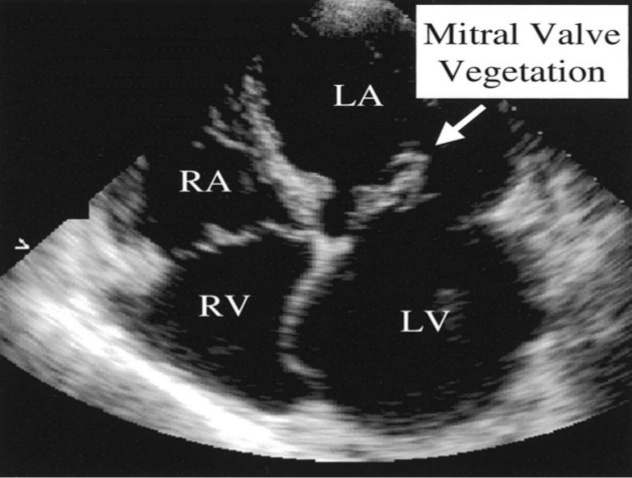 Valve regurgitation: Infective endocarditis can cause mitral, tricuspid, and aortic regurgitation. Future infections: Furthermore, mitral valve prolapse can predispose to future infections of the valve. Streptococcus viridian’s: is the most common overall cause. 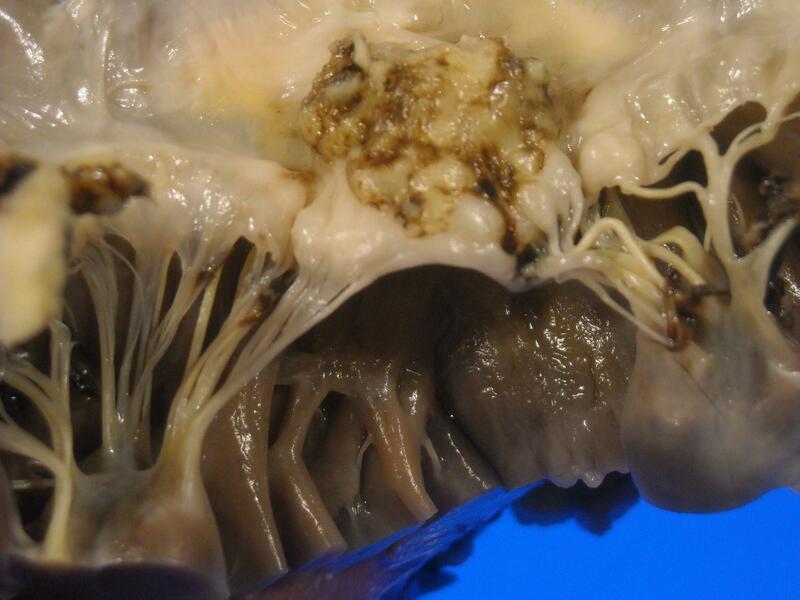 Staphylococosu epidermidis: is usually associated with endocarditis of prosthetic valves. Streptococcus bovis: is associated with endocarditis in patients with colorectal cancer. Candida albicans: can cause endocarditis in IV drug users.